Mike Glennon to become an unrestricted free agent will the Jets pursue him? Once again, it is time to start the Mike Glennon rumors and this time they may not be rumors after all. 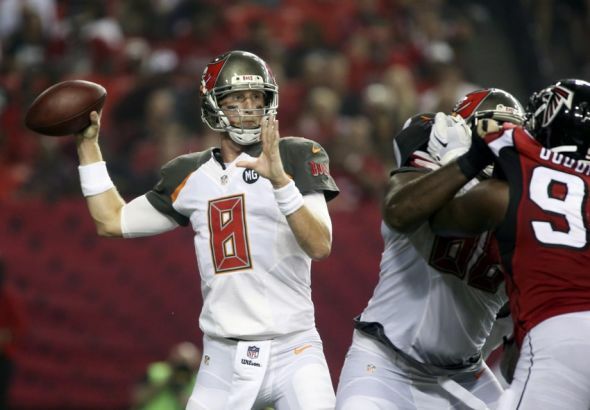 Mike Glennon’s contract has run its course in Tampa Bay and unless Bucs GM Jason Licht can get Glennon back under contract, he will test the Free agent waters. For the past couple of years, the name Mike Glennon had been associated with the New York Jets and this year is no different, except Glennon’s rookie contract has come to a head. Last year the Jet’s showed interest in Glennon, but Licht wanted more for the backup QB than the Jets were willing to give, mainly because the Jets had options at QB, even with the standoff with Fitzpatrick. Now that Glennon will become an unrestricted free agent, you better believe his phone has or will be ringing, and you better believe that one of those calls had been or will be from the Jets. Mike Glennon, the 27-year-old QB has thrown 30 touchdowns and 15 interceptions over 18 starts throughout his three seasons with Tampa, and despite not having a strong supporting cast, Glennon went 5-13. These past two seasons, Glennon found himself backing up the 2015 first round pick Jameis Winston and had not been able to fully showcase what might have become of the 4th year QB if he was given the opportunity to run this new Buccaneers offense that is more than capable of supporting their quarterback except once. Glennon was given the opportunity to give a glimpse of what could have been or may have been or might be, last season, during Tampa’s loss to the Falcons. Glennon was put into the game and came out firing. He completed 10 of 11 passes for 75 yards, a touchdown, an threw no interception. Whether or not that was purely Glennon’s ability to run the offense or if the Falcons just relaxed on the defense is up to debate. I, personally, believe despite any fact that the Falcons relaxed in defense had nothing to do with Glennon’s accuracy on the quick drive down the field and finding Cameron Brate in the end zone for the TD. Glennon had a similar outing in the 2014 loss to the Falcons when McCown was benched, when he went 17 of 24 for 122 yards and a TD to Vincent Jackson. While Glennon is not exactly a big name QB or has the appeal that comes with that name, he could be a perfect fit for the New York Jets who find themselves in dire straights in the QB position. Bryce Petty struggled during his brief appearance as the Jets starting QB, Fitzpatrick is unlikely to be called upon in the 2017 off-season, and their 2016 second round draft pick Chris Hackenberg was redshirted the whole season, and Geno Smith has proven himself not to be the guy to run the Jets. The Jets have the No. 6 pick in this year’s upcoming draft, and a QB selection would please the fans, however, the fact that Glennon could prove to be a low risk, high reward signing, might be a better option for the Jets who could use offensive line and secondary help with the No. 6 overall selection. I would expect there to be more Mike Glennon rumors to surface in the coming months, and one could be Tampa offering Glennon a contract. Tampa would be wise to re-sign Glennon, as he is a more than capable backup, although, I am pretty sure Glennon is tired of sitting the bench. Many Tampa fans are under the impression that Glennon is just a waste of money and space in Tampa, however, God forbid, if something were to happen to Jameis Winston, having a backup who knows the Tampa offense and has experience starting is a plus as opposed to being a monetary minus. Mike Glennon gaining interest as FA draws near. Mike Glennon preparing to test free agency. Can Fitzpatrick Keep The Magic Flowing? Is Chandler Catanzaro the Right Kicker for the Bucs? Jason Licht wants to keep Mike Glennon. Previous articleBlake Sims signs with Tampa again. Next articleVernon Hargreaves named to PFWA’S ALL-ROOKIE TEAM.